After a 71 minute weather delay, an announced crowd of 2,977 watched the Chesapeake Bayhawks face off against the Denver Outlaws in Chesapeake’s first MLL playoff game since winning the league title in 2013. The Outlaws robbed Chesapeake’s hopes of claiming that title escaping Annapolis with a 13-12 win. Despite getting sound goalie play from Niko Amato (14 saves on 27 shots) and, with a few lapses, playing a solid defensive game, the Bayhawks ultimately couldn’t overcome the loss of face off specialist Stephen Kelly. Denver won 21 of 29 face offs on the night. Whether a result of playoff nerves or the rain delay, sloppy play by both teams led to a low scoring first quarter that saw more turnovers than goals and ended with the score tied at two. Kylor Bellestri got Denver on the board first lacing a shot past Niko Amato. The Bayhawks countered with back to back scores. They broke the ice on a sharp angled shot by Josh Byrne assisted by Lyle Thompson. Steele Stanwick intercepted Dylan Ward’s attempted clear after a Chesapeake turnover and quick sticked it past the surprised Outlaws goalie giving Cchesapeake its first lead of the night. Maryland grad Drew Snider then pulled the Outlaws even with 2:10 to play. Denver rode the momentum of the late first period score into the second picking up back to back goals from Mike Schlosser and Zach Currier to take a 4-2 lead. However, a Chesapeake posse consisting of Myles Jones, Lyle Thompson and Matt Danowski responded with a trio of goals lassoing back the lead and putting the Bayhawks in front 5-4. That would mark a high point for the Bayhawks. They spent the remainder of the quarter and the first 8:38 of the third shooting blanks while Denver blew the door off the safe scoring four straight – including two in the second that gave them a 6-5 halftime lead. Currier was the Outlaws’ gang leader over this stretch scoring three times in succession. Trailing 8-5, Chesapeake finally ended their 15 minute 11 second drought when Thompson found his target and scored on an extra man opportunity. Josh Byrne followed with another goal just 12 seconds later on an assist from Jesse Berhnardt to pull the Bayhawks within one. Lyle Thompson, trailing Matt Bocklet, picked up a loose ball turnover on a failed clear attempt and dunked home his third of the night from just outside the crease tying the score at eight. Bellistri negated the comeback putting a shot past Niko Amato with 1:23 to play in the third and Denver was able to maintain the one goal lead they carried into the quarter. Eric Law extended the Outlaws’ lead to two on a spectacular behind the back goal but Chesapeake’s leading scorer Colin Heacock answered less than 30 seconds later to narrow the lead back to one. After a Denver turnover on a shot they failed to back up, Jones bounced off three Denver defenders to find open space and square the score again. A shot clock violation opened up a fast break opportunity for the Bayhawks and Thompson capitalized with his fourth of the night on an assist from Ryan Tucker. Chesapeake held an 11-10 lead with 10:31 to play. Two minutes later after a Chesapeake turnover, a foolish penalty in transition by Josh Byrne led to Denver capitalizing for the third time on three extra man chances. For the eight time in the game, the score was tied – this one at 11 all. 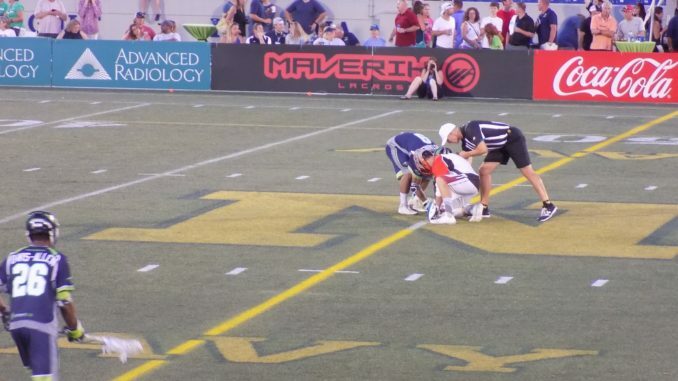 Chesapeake’s woes at the face off dot continued and Bellistri found the hole in the wall of the Bayhawks’ defense putting the Outlaws in front once again. A rare face off win for the Bayhawks resulted in a tomahawk goal by Heacock that tied the score at 12 with just over six minutes to play. Denver regained the lead with 3:53 to play when Chesapeake got caught in a bad transitional line change. The defense shifted toward Mike Schlosser leaving Matt Kavanaugh all alone on the back side for the easy score. Trailing 13-12 the Bayhawks had a final chance when Thompson worked his way open on Chesapeake’s final extra man opportunity but his shot with 4.5 seconds remaining sailed wide and the Bayhawks were unable to create a final chance. Denver moves on to the MLL title game for the third consecutive season. They will face the winner of the other semifinal between Dallas and New York on August 18 in Charleston, SC.